We begin tonight the fourth Summorum Pontificum Pilgrimage, coming together from around the world to the see of Peter and to the tomb of the Apostle in order to give thanks for the Motu Proprio of Benedict XVI which freed up the ancient roman liturgy. We come also to ask the Lord for His help, in our Dioceses, our Parishes, our communities and associations, to help us develop this holy form of the liturgy, which – as we know – brings fruits of faith, holiness, conversion, evangelization, and emergence of vocations. Our special intention for this year is for the Christian family, as the second meeting of the Synod of Bishops on this very subject reaches its conclusion. I extend sincere thanks to the prelates in attendance this evening for their gracious presence: His Excellency Archbishop François Bacqué, Papal Nuncio, His Excellency Bishop Juan Rodolfo Laise, our celebrant for tonight’s Vespers, and the Most Reverend Dom Jean Pateau, Abbot of Fontgombault. In the name of all, I am particularly thankful to Frather Joseph Kramer, Parish Priest of Trinità dei Pellegrini, together with those who assist him, for the efforts they repeatedly put in each year to welcome us during this sort of Triduum, thus admirably continuing to fulfill the vocation of care for pilgrims associated with the founding of this church by the Confraternity of the Trinity of the Pilgrims, itself founded by St. Philip Neri, also the Patron of this Pilgrimage. I think in particular of the assistance to poor pilgrims. 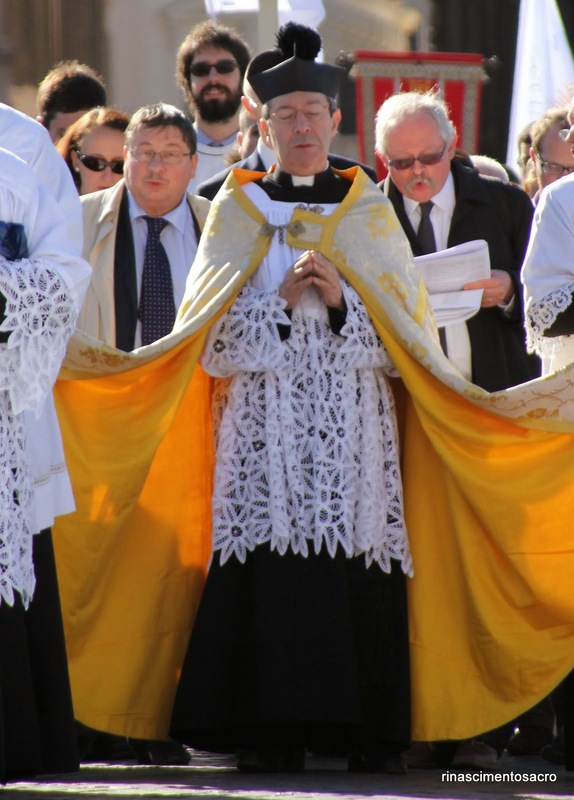 Are not we, who are attached to the traditional Mass, also poor in a certain way? Sometimes we have even been left out, considered as Christians from the “peripheries”, as Pope Francis likes to say. We like to think that in this way we represent, here in Rome, the populus Summorum Pontificum, that is to say all those priests, religious, seminarians and faithful attached to the traditional Mass. Indeed, looking back over the last fifty years, we see that the preservation of the traditional Mass is due to a kind of instinct of faith among the Christian people. That sensus fidelium is a bit like a prayer pleading the hierarchy to intervene, that which it did in 2007 with Summorum Pontificum, thus confirming the merits of the celebration of the usus antiquior. May it do so again in the future, because the history – our history – still goes on. In the Church of tomorrow – a Church of large Christian families, of priests fully aware of their priestly identity, of missionary apostles, and of religious communities and associations that show the eternal youth of the Church – the traditional liturgy, ever young, shall surely play a role in the sacramental order as a ferment of spiritual growth. It is with this conviction that we, in our broad variety of origins and sensibilities, have come to bring ad Petri Sedem, our prayers, our celebrations, offering here in Rome the efforts, constancy and sacrifices of those whom we wish to represent, requesting for ourselves and for them the blessing of Peter which we will receive Saturday in the Vatican Basilica.